From our first strategy meeting to the ribbon cutting, the story of how we created the complete corporate rebrand of one of Toronto’s top accounting firms, Stern Cohen LLP. As with any corporate rebranding project, our relationship with Stern Cohen began with a series of discovery meetings and conference calls to collectively identify project goals and put together our initial logo design and website design strategy. Through this process, we aim to not only gain a more thorough understanding of our client’s business and service offerings, but also get to know the people and corporate culture that makes this group of Toronto-based financial service professionals unique within their industry, and from their top competitors. Following our early strategy work, the Parachute Design team created a plan of action that would serve as a roadmap for all parties involved in the corporate rebranding to follow, for the logo design and subsequent website design work. With our plan in hand and ready to begin our creative journey together, we tackled the rebranding exercise first with a slew of logo design concepts that we reviewed internally in order to narrow down our best work for presentation to our client. Having already invested significant time in our design strategy with the Stern Cohen team in the early going, we had a clear vision of their unique personality, which would ultimately help us design what would become an award-winning brand in the North American financial industry. This process was extremely quick and smooth for everyone involved, as lines of communication and design feedback remained open throughout the rebranding process. Within a week we had a strong, contemporary logo design that brought the firm’s corporate image forward from its predecessor. With this first step behind us, our graphic designers began expanding this new brand and developing new corporate communication materials and marketing tools, including business cards and a series of print ads for industry events and publications. Key features in the new website design for this financial services firm included subtle parallax scrolling effects to create visual interest and offer improved user engagement. More emphasis was placed on the Stern Cohen team, their personal stories and methods of contact, including downloadable v-cards and connections to their informative social media accounts. A careers section was designed offering the ability for the website administrator to easily post job openings, which connected to web application forms in order to minimise our client’s day-to-day efforts by automating as much of this process as possible. 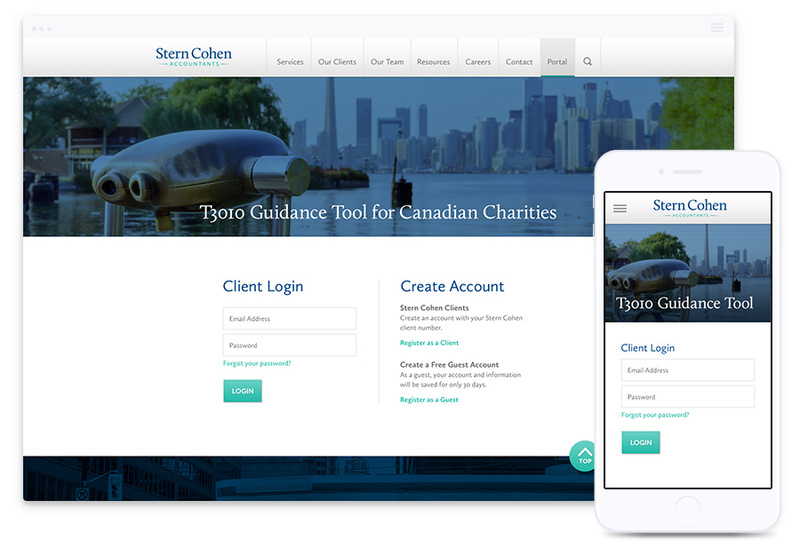 In addition to the new careers section, our Toronto website designers created and developed a secure members portal allowing Stern Cohen’s clients to register online and upload their financial information securely to their assigned accountant, as well as providing access to downloadable files and forms previously managed individually by each accountant or their assistant. 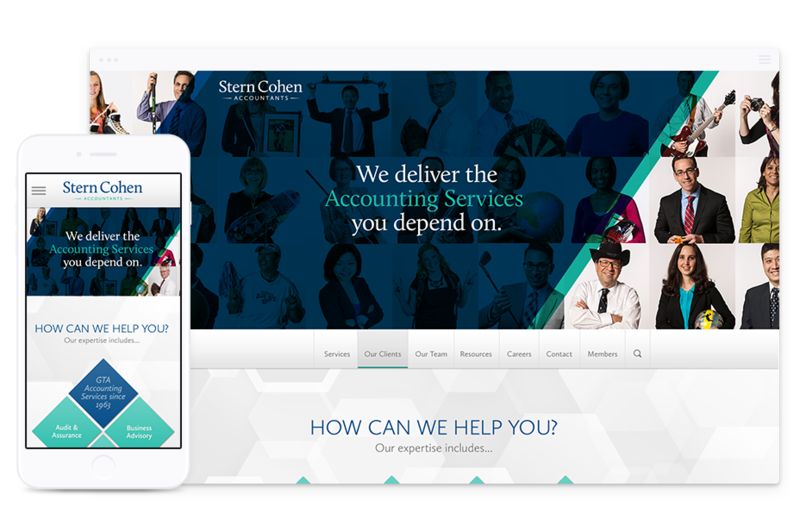 As with just about every website design, we create these days, the Stern Cohen website was no different in its need for mobile responsiveness. One of the most impactful improvements we determined to be essential in the new website design for this financial services firm was creating a fully responsive website design so that Stern Cohen could reach a changing and more youth-driven audience. The responsive website design enables users to access and experience the complete website from any device, whether it be a desktop or laptop computer, or a tablet or mobile phone. To offer an optimised user experience for mobile visitors, we froze the parallax effect to minimise load time and prevent any of the common hiccups parallax websites experience with mobile devices. After vetting a short list of several well-regarded Toronto web design firms, we chose Parachute Design. I was impressed with their design sense, as well as the helpful and positive attitude of their Principal & Art Director, Jay Eckert. Their very competitive price was another bonus. Thanks to Parachute’s experience and patient guidance, what seemed like a gargantuan project was, in the end, very manageable. One of our key goals was to create a web presence unlike traditional (boring) accounting firm websites as we are not your typical accounting firm – thankfully our new website certainly reflects that! We now have a contemporary, SEO-optimized, responsive website that we are enormously proud of. I highly recommend Parachute on behalf of everyone at Stern Cohen LLP! Another key requirement established during our initial strategy work with Stern Cohen was the ability to quickly and easily manage website content. We recommended the open-source WordPress content management system (CMS) for its widely known ease-of-use and flexibility to meet the unique demands of almost any website design project. Our client’s Marketing Communications Director, Julie James, made this decision much simpler as she had a very positive experience with the WordPress platform in the past on both professional and personal projects. This made our customary CMS training a breeze! Due to the nature of Stern Cohen’s business in the financial industry, online security was a crucial factor in the planning and development of the new responsive website. Not only was the security of the member registration process and member information a key component in the design and development of the new website, but also and perhaps more so, was the secure transmission of personal financial documents and information from Stern Cohen’s clients directly to their assigned accountants through the secure Member Portal. In addition to our development process, steps were also taken through our partnership with Stern Cohen’s in-house IT team to select and setup a secure server environment. In the months to come post-deployment, Stern Cohen was nominated and ultimately won awards for both their updated logo design and website design within the North American financial industry. 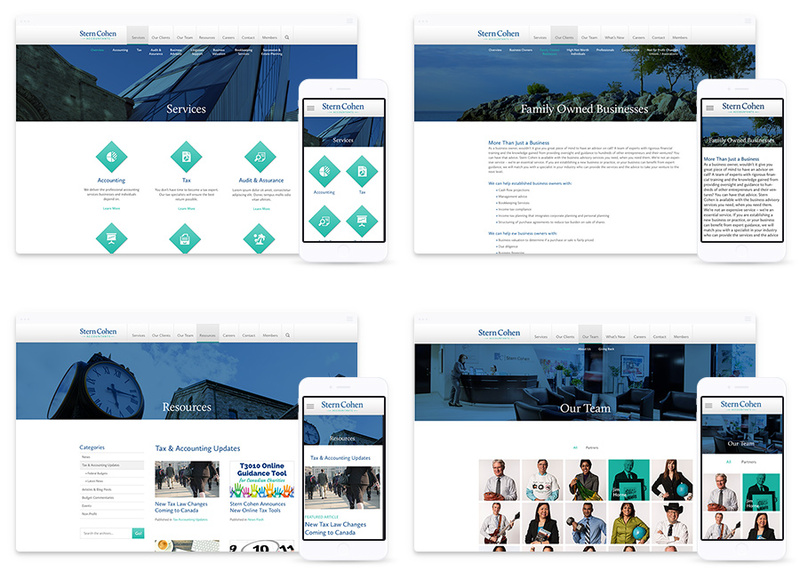 When a relationship grows from an initial email inquiry to creating a best-in-class website design and brand development, we can’t help but take a moment to reflect on the difference hard work, collaboration, and experience can make for our clients. Located in Toronto, Ontario, Parachute Design has been creating professional website design, logo design and branding for clients across North America for more than 15 years. Our Toronto website designers boast years of experience in creating winning website design for accounting firms in addition to professional brand and logo development. If you are an accounting firm or financial services organisation that is looking to improve your logo design, branding, or website design experience, and you would like to request a proposal, please complete our online quote request form, or call our Toronto branding and web design company at 416-901-8633. Creating a successful website design can be a challenging task without the right experience. Let us help you create a plan for a winning website, the first time.